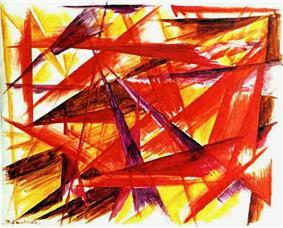 Rayonism (or Rayonnism) is a style of abstract art that developed in Russia in 1911. Mikhail Larionov and Natalia Goncharova developed rayonism after hearing a series of lectures about Futurism by Marinetti in Moscow. The Futurists took speed, technology and modernity as their inspiration, depicting the dynamic character of early 20th century life. They glorified war and the machine age, and favoured the growth of Fascism. The style of Rayonnist painting that we advance signifies spatial forms which are obtained arising from the intersection of the reflected rays of various objects, and forms chosen by the artist's will. The ray is depicted provisionally on the surface by a colored line. That which is valuable for the lover of painting finds its maximum expression in a rayonnist picture. The objects that we see in life play no role here, but that which is the essence of painting itself can be shown here best of all--the combination of color, its saturation, the relation of colored masses, depth, texture. An essay on the Russian avant-garde by faculty at Northwestern University. by Alexander Boguslawski atRussian Painting Rollins College.